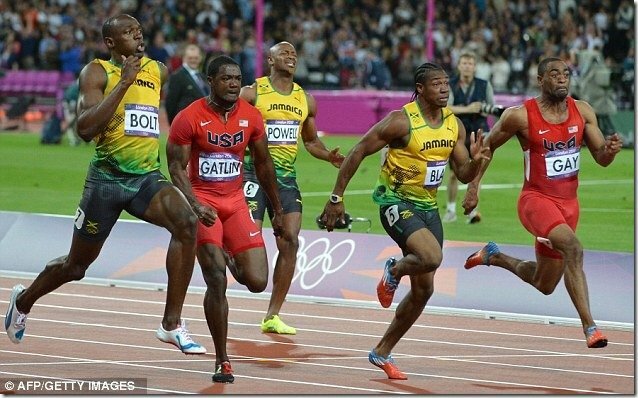 After reading Jimson’s response to questions regarding Justin Gatlin’s endorsement of VertiMax, I thought it might be valuable to re-assess the various Strength/Power Training Methods that have been proven, through peer-reviewed research studies, on elite or national level sprinters and/or athletes in speed oriented sports (rugby backs, soccer players, etc.). Most of the studies that reveal positive correlation between Specific Strength/ Power exercises and Maximum Velocity, Acceleration or Explosive Block Starts involve weight room exercises with Olympic Bars, Kettle Bells and Complexes involving weights with Plyo-Boxes and Elastic Bands CAN be found in the references listed in STRENGTH AND POWER FOR MAXIMUM SPEED (2010) here on this website. Squats, Jump Squats, Speed Squats, Pause Squats, Counter Movement Box Jumps, Kettle Bell Hip Thrusts, Box Drops w/ Vertical Jump, BarBell Step-ups, Accelerated Dumbell Step-ups, etc. 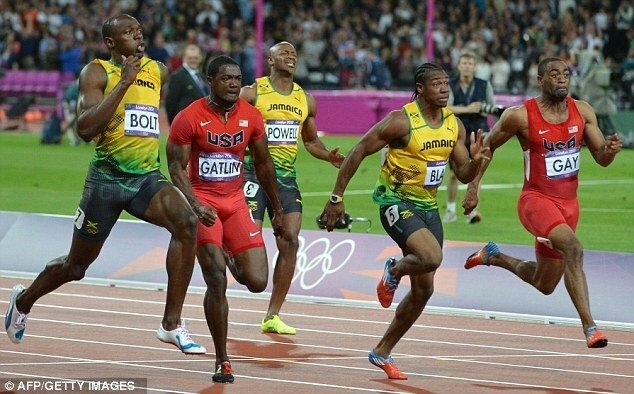 have all been found to develop the strength/ power needed for improving the various components of the Sprint Race. a knowledgeable Strength & Conditioning Specialist to monitor the training. First, it is important to define the various types of strength that influence sprint speed development. Before getting into the On-Track Methods for training these various types of Strength/Power OUTSIDE the weight room, it is important to review what Biomechanical Analysis has suggested in regards to the specific areas in which Strength and Power training might best be applied. Prior to this statement, Mann lists three major challenges that elite sprinters must overcome. The first challenge involves the sheer magnitude of the demands. The hip extensors demand peaks that are near the limits of human performance at ground contact. Mann states that only the most powerful of athletes have the ability to produce the leg extension forces needed to produce an effective action. The second challenge involves force demands as the emphasis shifts from hip extensors to hip flexors. Mann points out the extreme difficulty of producing these forces effectively at rotational speeds of over 500 degrees per second. 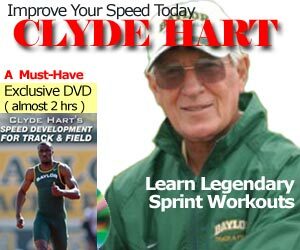 In an earlier article on Speed Endurance titled: Neuro-Biomechanics of Maximum Velocity Sprinting, By Loren Seagrave, (Read Part 1 and Part 2) the following points from this article both concur with Mann and elaborate on how to “teach” what Mann proposes from his above statements derived from his biomechanical analysis. “The prime example comes in the transition into the Residual Phase, where the brain must send the message to dorsiflex the foot before T.O. (take-off) into the Residual Phase. German studies have shown EMG messages occurring while the foot is still in contact prior to T.O. At T.O. there is stored elastic energy if the foot is dorsiflexed, thus reducing the amount of time required to recover the leg (i.e. get the thigh and leg moving forwards sooner after T.O. to save time in the Recovery Phase. The cue for therapists when reteaching someone to walk is not to lift the knee, but lift the top of the foot! This evokes the “triple response”; by curling the toe up (lifting the top of the foot) the knee and hip also respond! Those with too pronounced backside mechanics and slow recovery do not send this message of dorsiflexion soon enough. Since recovery requires velocities of over 400 degs/sec, the smaller muscles must do it, not the larger ones. “Another cue to look for as a coach is the angle between the thighs at the moment the foot touches the ground. The knees should be at least together: an excellent measure of quality and perfection of leg recovery mechanics. If there is light, i.e. some angle between the legs at TD, then a forward TD and braking is occurring, thus Vmax is reduced. In drills, sprinters should shift the hip forward – this avoids stress on the ham from hip back. The shoulders should remain directly above the hips, and the athlete should use the lower two abdominals to stabilize the pelvis (the upper four are used for breathing). This is a skill, and like any it can be unlearned and overridden by bad technique! READ Should Sprinters Do Long Runs? … that can be developed via teaching the Neural Aspects of Active Touchdown and Takeoff Techniques AND the use of Strength and Power Methods that transfer directly to both Horizontal and Vertical Components of Force Application and Active Touchdown and Take-off abilities of the sprinter. So, in addition to frequent and consistent teaching of proper sprint mechanics and the various drills that BOTH enhance sprint mechanics AND, like “Fast Leg” and “High Knee” Drills, help develop the necessary Hip Flexor Strength needed for optimal performance. Part II below will give some limited examples of the various methods to achieve optimal strength and power development in order to meet the biomechanical demands of applying the optimal Touchdown and Takefoff forces necessary for maximum sprint speed development. can be integrated into the sprint training session with use of On-Track Methods utilizing sleds, tubing, Bullet Belts, Plyo-Boxes, MedBall Throws/Jumps, Bounding, Hopping and BW Lunge and Squat variations.